These little morsels of nutrition are going to fill you right up with all the good grains they hold. 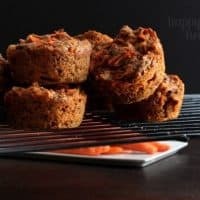 Carrot Raisin Muffins may sound like someone only a health-nut would eat, but I assure you, my 7 year old candy-lovin-kiddo just gobbled them right up with no complaints! You know what I realized with this photo shoot? 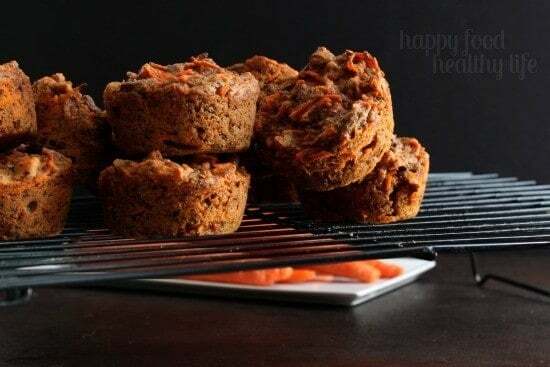 Healthy foods, especially healthy muffins, are not always the most photogenic of objects. I mean, I’d much rather be photographing a beautiful pale muffin with a golden top, maybe with some drippy glaze pouring over the sides. No, but really. Healthy muffins are not soft and pillowy. They’re usually dense, full of grains, they don’t always rise very much over the top, so there is no muffin top, and they’re just downright not very pretty. This is apparent in my healthy Breakfast Cookies as well as my Applesauce Cinnamon Apple Oat Muffins. I’m telling you this, because I am proud to say that this shoot is my first ever full-manual photo shoot. I adjusting all the buttons and levels and whatever else there is to adjust, and this is what I came out with. No, it’s not perfect. Yes, there’s definitely room for improvement. But I’d say it’s a good starting place. 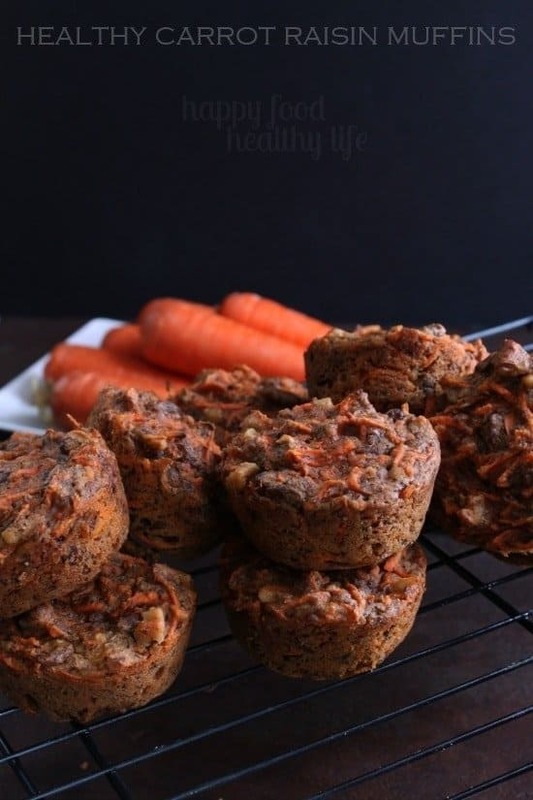 So about these ugly healthy Carrot Raisin Muffins. Seriously, don’t pay any attention to all those carrots poking out of the muffins. Ignore them. Because your tastebuds will if you do. You will taste the sweet and plump raisins. The applesauce will add another layer of sweetness as well. 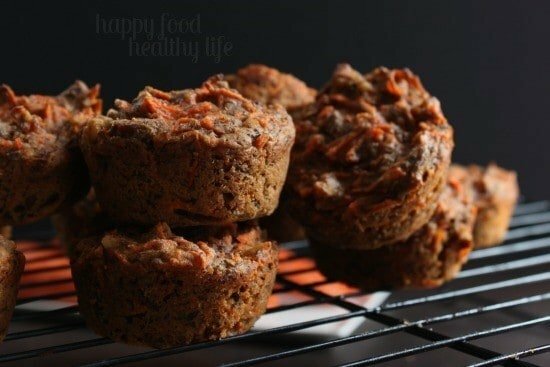 And using Whole Wheat pastry flour instead of full whole wheat flour will be sure to keep these muffins light. I’m sure you’re used to your healthy muffins being hard, dense, and really difficult to chew because they’re just so heavy. This is not the case here! And the great thing, you’ll have them in the oven within about 15 minutes, max! So get to it! Preheat the oven to 400 degrees F. Line a muffin pan with baking cups or lightly grease with coconut oil. Mix the flours, flaxseed, baking soda, cinnamon, nutmeg, and sugar. Create a small well in the center and add in the milk, applesauce, and vanilla. Mix until there are no more clumps of flour or flaxseed. Fold in carrots, then raisins and pecans, if using. Fill the muffin cups full. Bake for 20 minutes or until a toothpick comes out clean.